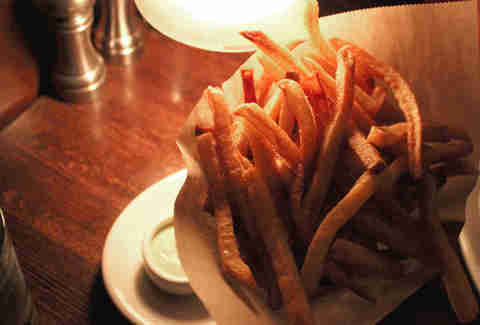 The near epitome of the perfect fry, these little devils are cooked crisp and salted to perfection. Please take heed here and order the optional side of Béarnaise. Do not, we repeat, DO NOT skip the Béarnaise. After slathering your fries in the decedent butter-based sauce, you’ll definitely be reconsidering reaching for the ketchup ever again. Crispy frie with the perfect crunch to potato ratio. Factor in the delightfully astringent lemon and tarragon aioli and you’ve got yourself a match made in French fry heaven. They’re the perfect partner to just about anything, although we might suggest you go for the fried egg and harissa sandwich. It’s another classic in its own right. Big flakes of Parmesan cheese and a touch of truffle oil top these thick-cut salty little fries, which can also be had with a side of kimchi aioli that serves as the perfect foil to the earthy flavor of the potatoes. 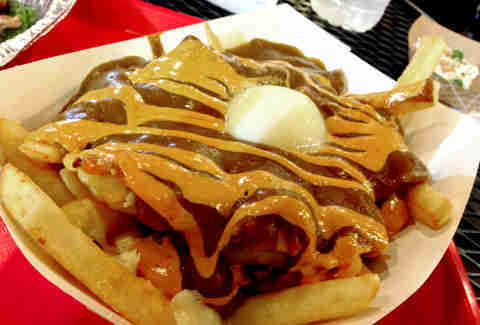 OR… you could just go ahead and get the poutine, it’s a fan (and Thrillist) favorite. How does one improve upon a simple French fry? 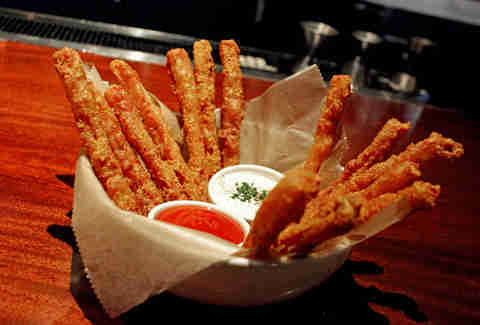 Why not dunk them in beer batter and then deep fry it? That’s exactly what the folks over at Butcher & the Boar are doing and it’s totally worth it. These thick, Fulton-beer battered, crispy planks of potato are an often overlooked menu item amongst the sea of meats, but you’d be doing yourself a disservice by not ordering them. Located inside the classic St. Paul dive bar known as Half Time Rec, sits an unassuming little kitchen featuring some of the most innovative takes on Irish pub fare that the world has ever seen. We’re not even kidding here. Not even in London, or Dublin are the "chips" so… well, chip-like. 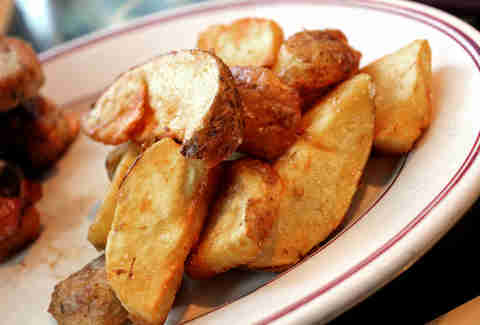 These golden fried potato wedges are fried to a crisp golden brown and dressed with a bit of sea salt making them the perfect accompaniment to just about anything. Frities at their finest! 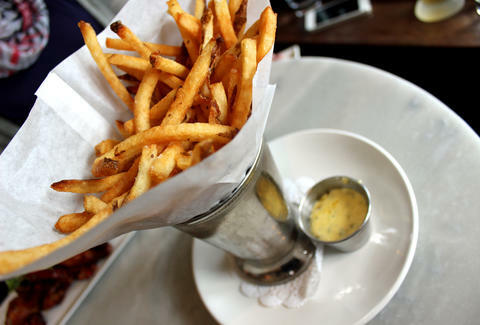 If there’s anything the folks over at Barbette know, its classic French fare and these pomme frites are the evidence that slams this case shut. 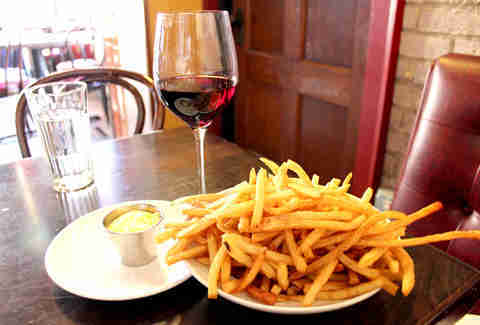 Served with a side of rich, yet slightly tangy, saffron aioli, the only other thing you’ll need is a big glass of wine and good book and you’ll feel like you're right at home, but with really awesome fries. We’ve had duck fries and fries drowned to death in truffle oil, but over in St. Paul, their giving their potatoes a bath in hot beef fat. That’s right, rich, succulent beef fat is what helps give these fries a distinctive edge over the rest of the sack. These crispy little morsels make for the ideal bar snack. Perfectly golden brown, they snap when you bite them, and they're salted like a boss. 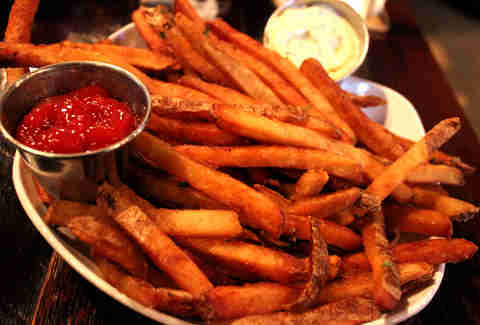 Served with a bit of ketchup and a creamy herbed aioli, these fries are an excellent companion to any one of Muddy’s 30 craft drafts. When you’re burger is called “the perfect burger,” you’d better have a solid side of fries to go along with that. Fortunately this North Minneapolis gastro-bistro is no slouch. 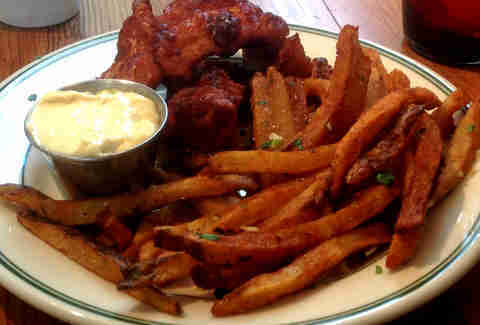 Not only are the fries golden and crispy, they’re also covered in bacon powder. Yeah, you read that right, bacon powder. Usually when it comes to dipping your fries, you'd think it'd be hard to beat the classic Heinz, yet the “fry sauce” they serve at this Linden Hills bistro is a liquid wonder. 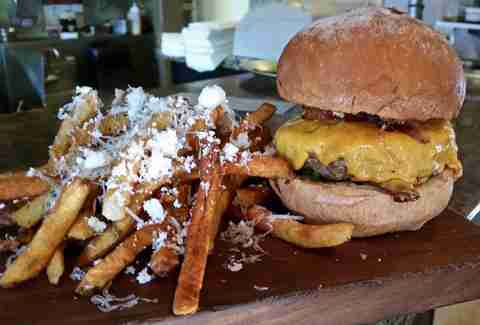 It serves as a perfect foil to the crisp, thin-cut, salty fries, which also happen to pair particularly well with the fine selection of craft beers.